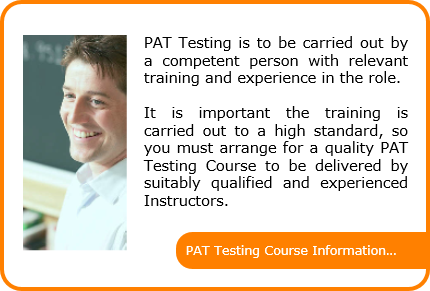 At Priory we only employ qualified Instructors with extensive PAT Testing experience in a multitude of environments. To be able to share their knowledge, our Instructors need to know their subject inside out – let’s face it, they will never know what question they will be asked next. Our courses are intensive – electrical safety is a complex subject. However, your course instructor will take you through the processes in a logical manner at a pace to suit you. 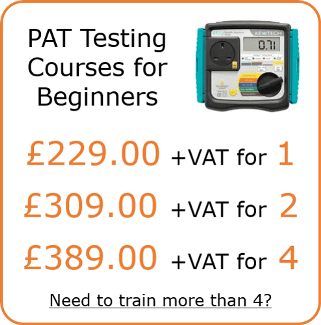 As PAT Testing is based upon guidelines and best practice, you’ll begin by learning the origins of testing and its importance in your workplace. On top of this comes basic electrical theory, the design of appliances and the role of manufacturers when dealing with electrical safety. Once you know how an appliance has been constructed, you can determine what tests can be carried out and what the test equipment actually does to the appliance. Once we have covered the theory, you will progress onto putting the theory into practice. The afternoon session is your chance to get your hands on the test equipment and appliances (some of which may have faults in order to test your understanding). By covering a variety of appliances, we can start to personalise the training and make it relate to the appliances at your premises. Whilst we cannot guarantee you will pass the course – in the same way a learner driver cannot guarantee they will pass their driving test, we will do everything in our power to guide you through the day. 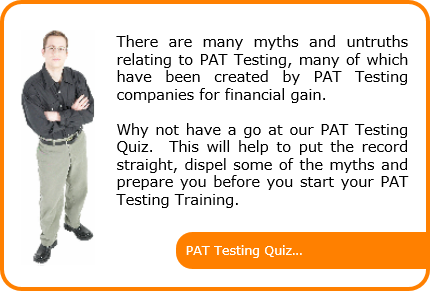 Should you pass the practical and exam sessions, you will be certified as an officially qualified tester – but remember, you won’t be an expert straight away, after all, Rome wasn’t built in a day. We carry out courses throughout England and Wales, normally at your premises, so there should be no difficulties for you getting to your training venue. We don’t charge you for our fuel or accommodation – let that be our problem, not yours. 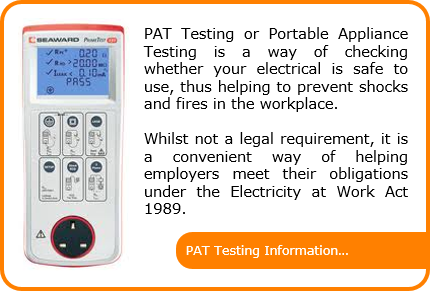 Whilst not a legal requirement, PAT Testing won’t go away. Instead it is evolving and has changed significantly since it was introduced in its current format 25 years ago. Rather than testing every appliance every 12 months, a risk based approach has been adopted which requires more management and ‘fine tuning’ of the process. By bringing the task in-house you are able to closely match the testing to your specific requirements, whilst saving on Qualified Contractor costs. The largest and most important part of testing isn’t the actual testing, but instead it’s the User Check and Formal Visual Inspection. Typical appliance faults are normally missed by electrically testing the appliance, but are easily spotted by just having a good look at it. Getting your work colleagues on-board with this concept will save you time and effort, whilst making the workplace a safer place. For smaller operations e.g. DJs, self-employed construction workers, landlords etc, carrying out your own testing at a time to suit you puts you in the driving seat, without having to pay excessive ‘day rates’ due to your lower numbers of appliances. How many people do you allow on Courses? Whilst we prefer a group of 4 people, we normally allow a maximum of 8 people on any of our 1 day courses. Each person will need a bit of 1-on-1 time at some point in the day, so if the group is too big, this can be a problem. Should you require more people to attend, we can accommodate that by bringing more Trainers to the course. Upon successful completion of the practical session and multiple choice exam you will have earned a Certificate of Achievement, stating your ability to carry out In-Service Inspection and Testing of Electrical Equipment, as defined by the IET Code of Practice (4th Edition). These are sent to you via 1st Class Recorded Post. Do I have to complete an examination? You won’t like to hear this, but yes. In fact there are two, but the first one is just a practice paper to get you accustomed to the question style. The second paper is the one which counts. 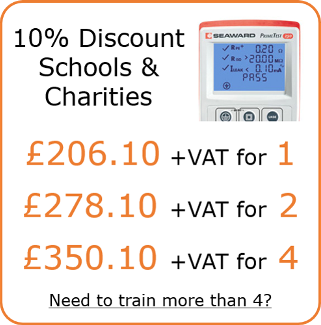 Can I attend a Training Course if I’ve never had any electrical training or experience? Whilst some people have a level of technical knowledge, the majority have very little. We assume that everyone knows nothing, and if it turns out that you have some previous knowledge, that is a bonus. In order to prepare you a little for the course, we ask that you do a little ‘homework’ in the form of a multiple choice online quiz. This will introduce you to some of the terminology we will be using and give you a push in the right direction. On top of that you can have your Trainer’s mobile phone number. If you get stuck at any stage, give him a call and he will talk you through it. Alternatively you can call our office. If you think you need more help, why not take our 2 day course instead.